N ward 2 village in Mbire, local residents gather to welcome a new member of their community. The Moyos are celebrating the birth of a baby girl they have christened Anotida with ululations, food and a specially prepared local brew. “My husband wanted a baby boy, but God gave us a girl,” the 29-year-old wife said. Just like Anotida’s older toddler, she will also not be able to get a birth certificate. The reason Anotida cannot have a birth certificate is that her mother has never had a birth certificate in her life, just like many other villagers in this secluded community of Doma. Birth registration is fundamental in Zimbabwe to securing the child’s rights to a name, identity, and nationality. Without possessing a birth certificate, Anotida is restricted from accessing public services such as education, healthcare, and vaccination. Anotida faces the spectre of being one of the growing number of invisible children who cannot have their birth officially registered. Zimbabwe has a fairly low rate of birth registrations in sub-Saharan Africa, with nearly a third of all children not possessing a birth certificate, according to the Research and Advocacy Unit. Curiously, the Zimbabwean Constitution and the Births and Deaths Registration Act do not expressly state that birth registration is a child’s right. Activists say this is very worrying considering that Zimbabwe has ratified the African Charter on the Rights and Welfare of the African Child and the United Nations Convention on the Rights of the Child. These two instruments emphasize a child’s right to a name and nationality, and make registration immediately after birth compulsory as a fundamental human right. Mbire district in Mashonaland province is a microcosm of what is happening in other rural districts in Zimbabwe. Katswe Sisterhood programme officer Fadziso Fadzisayi Maunganidze told the Daily News on Sunday that most of the rural communities do not have national identity cards (IDs) and birth certificates. “So we were saying most of the women do not have IDs because their parents do not have IDs as well. “Some don’t even know their date of births, they were born in their rural homes, not in a hospital or clinic for example ward 2, the Doma community,” Maunganidze said, adding such births are hardly reported or recorded formally. Given the underdevelopment in this community, this area has basic clinical and maternity services far from their homes, and several just resort to giving birth at home with the help of traditional midwives. The Katswe Sisterhood child’s rights campaigners say ensuring every child’s birth is registered is crucial to protecting their basic rights and access to healthcare, education and justice. Birth registration also helps to protect children from early marriage and child labour, campaigners say. In rural schools, children are often allowed in school without a birth certificate, but they’re not allowed to take national examinations. This leaves women in these areas trapped in a cycle of poverty. This demographic without birth certificates struggle to access financial services and so many miss out on important economic opportunities, such as formal employment or owning a registered business. In Zimbabwe, private and public institutions need proof that you are who you say you are for example, for banking and to vote. Generally, an ID card is one of the easiest documents to get in Zimbabwe, as long as you have all the things that are required. These are the long birth certificate and the father’s identity card. Photographing and the taking of fingerprints is done free of charge as long as you are aged between 16 and 18, a measure that has been put in place as an incentive for people to get their identity cards at an early age. In Mbire, failure to have an ID is potentially devastating, especially to women’s social lives. 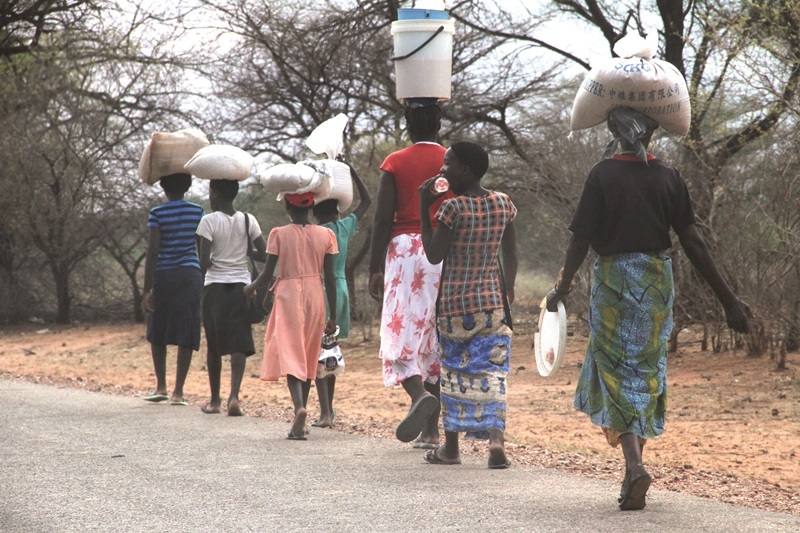 “They can’t register for collection of cotton seed, Ecocash or other things that require IDs. So, the men end up having power over them because they will not be contributing anything,” Maunganidze said. Most of these women solely rely on their husbands, the revered Shewe. Shewe is also in charge of all the money, enjoying the conveniences of technology from mobile phones, including mobile money banking, causing many of the women to remain economically-dependent upon their husbands. According to recent statistics, out of 6,73 million people who own bank accounts in the country, only 1,73 million are women. These disenfranchised women in Mbire also suffer gender-based violence due to lack economic freedom. “Some men take ARVs and they will not disclose to their wives, choosing to beat their wives into submission when the women find out. They also said women suffer economic abuse as they are short changed by men after cotton sales. “The women can’t use cell phones, and mobile money accounts are in husband’s names who then hide transactions. “Many abused women cannot report to the police because they are afraid of the husband’s relatives. For some, the husbands are the bread winners so they will rather stay in an abusive relationship than reporting. “However village heads are not dealing with them due to corruption and fear of witchcraft,” Maunganidze said of the Mbire women’s ordeal. Katswe Sistahood has been dealing with several cases of women who do not have IDs. “We are giving them a platform to speak out against violence against women. Community members are also given legal advice by our legal officer on how to handle cases of divorce, money, obtaining identity documents and reporting GBV,” she said. The problem is nationwide. For instance, Members of Parliament’s thematic committee on Peace and Security have queried why the Matabeleland region recorded low numbers during ID issuance blitz by the Registrar-General (RG)’s office just before the 2018 elections. This comes amid concerns that most people in the region have been failing to get IDs, with some alleging it is due to most of them not having birth certificates after having lost their parents and guardians to the Gukurahundi atrocities. However, the RG Office has angrily rejected accusations that the low numbers had anything to do with Gukurahundi. In the 1980s about 20 000 civilians were massacred in Matabeleland and nearby regions. Out of the total 393 898 national IDs issued by the RG in September, only 52 911 were from Matabeleland North, Matabeleland South and Bulawayo. Rural districts in the southern country harbour the most disadvantaged population in the country. The implications of registration go beyond individual rights and opportunities. Can President Emmerson Mnangagwa, Zanu Pf fix the economy?